Most invertebrates on Thásos are inconspicuous and unlikely to be seen by the casual observer. A few, however, are sufficiently obvious and evidently different from anything visitors from more northern and western climes may be used to that they draw attention. The most striking of these must be the fireflies. In late May and June luminescent flashes of green light mark the location of these remarkable beetles as the female ‘calls’ from a vantage point in dry grassland and the males fly around a few feet above the ground advertising their presence. In flight, the males emit a bright flash about once a second but the female’s response is a longer duller glow from a stationary position. The old pasture at the side of the river next to Hotel Aethria in Thassos Town is a good place to see them and they are also present on the ridge between the old Fort and the Temple of Athena (but much harder to see now that the area is floodlit). The species here is the widespread Mediterranean firefly, Luciola lusitanica (Coleoptera, Lampyridae), but others may occur. Another unmistakable invertebrate ‘event’ of summer is the constant song of the crickets from late afternoon/early evening onwards. Several species are involved but I suspect that the tree cricket Oecanthus pelluscens (Orthoptera, Gryllidae) is one of the main culprits. All of the likely choristers are ventriloqual and it can be extremely difficult to pinpoint exactly where the sound is coming from. The noise is made by the crickets rubbing their forewings together very fast over their backs, but cicadas make their shrill song by vibrating membranes on the side of their bodies. 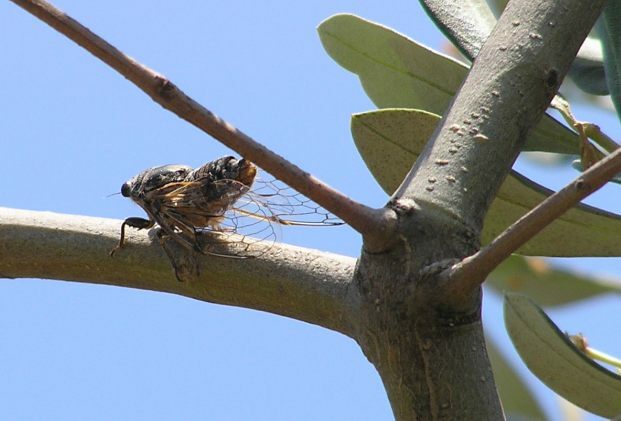 Cicadas certainly occur on Thásos but so far I have been unable to determine which species are involved. From mid-summer there is a seemingly endless cacophony from their perches in lowland scrub and high up on the branches of conifers. 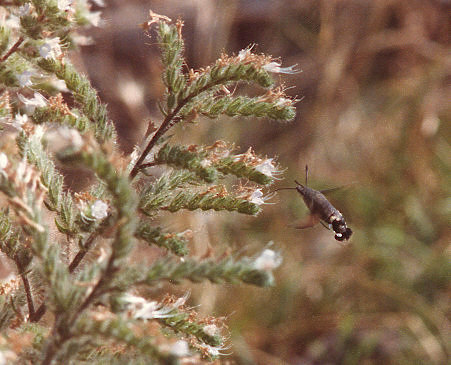 Three aculeates (Hymenoptera, Aculeata) are widespread on the island in summer and are noticeable for their large size. The carpenter bees (chiefly Xylocopa violacea) are magnificent black bees that make a conspicuous hum as they fly fairly ponderously from flower to flower. They are not known to be aggressive and very rarely sting. The velvet wasp, Megascolia maculata is one of the largest Hymenopterans in Europe and is a beautiful insect with golden yellow bands across its dark brown abdomen. It is harmless to Man but, as they fly fast and are very big, they can cause unfounded alarm. Hornets are also common in the lowlands and in mid-late summer can be seen patrolling most of the island’s beaches or nesting in the old olive groves. Obviously hornets can be very aggressive if their nest is disturbed but generally they ignore Man (unlike many of the social wasps) and will fly up and down beaches looking for food sources without paying any attention to holidaymakers. 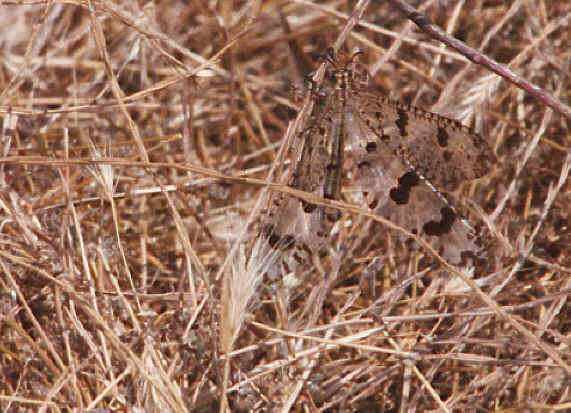 Two species, V. crabro and V. orientalis, have been reported from Thásos. Recently social waps have caused some problems on beaches in late summer, especially on Golden Beach on the east coast. There are certainly good and bad years for social wasps but if you are unlucky to visit when they are a nusiance then it is best to avoid beaches with lots of tourists, particularly those with beachside tavernas and other food outlets as these attract the wasps in the first place. 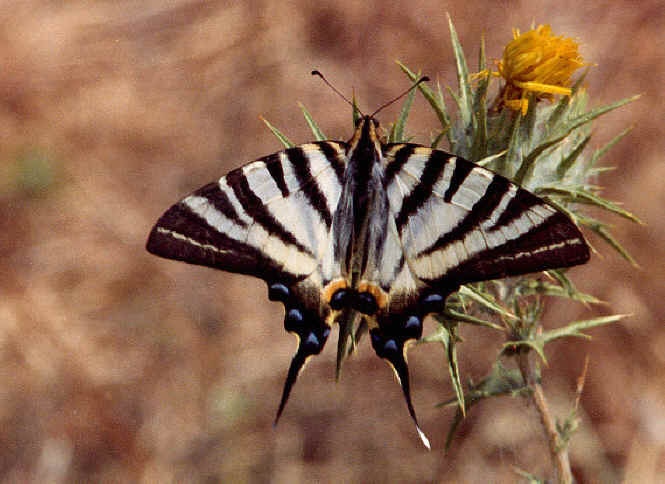 A striking butterfly (Lepidoptera, Rhopalocera) that is quite common on Thásos through the summer is the scarce swallowtail Iphiclides podalirius, which can be easily approached as it sips nectar from tall flowers such as thistles. Similarly, the cardinal Argynnis pandora (a relative of the silver-washed fritillary Argynnis paphia), with its pink-flushed hindwings, is widespread on the island and likely to be seen by many visitors. 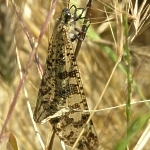 The giant peacock moth Saturnia pyri is nocturnal but may be seen at balcony lights or street lamps in early summer. It resembles a large version of the emperor moth Saturnia pavonia and is the biggest moth in Europe. With a wingspan of 15 cms, it can be mistaken in flight as a bat. Hummingbird hawkmoths Macroglossum stellatarum are commonly seen throughout the summer. 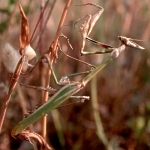 It is also at night that the preying mantis Mantis religiosa (Dictyoptera: Mantodea) is most often seen as adults frequently visit artificial lights, presumably attracted by the presence of numerous moths. During the day they hide in the undergrowth where they are well camouflaged. They are voracious predators of other insects, including their own kind, but are harmless to Man. 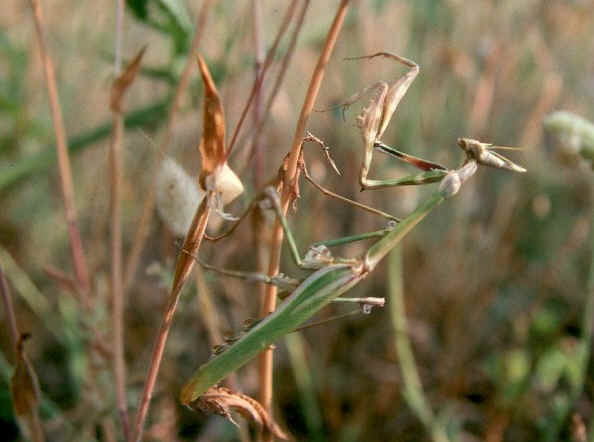 Several other mantis species occur, including Empusa fasciata with its distinctive pointed head. Equally fearsome predators of small insects are the ant-lions (Neuroptera, Myrmeleonidae). The larval pits of Myrmeleon formicarius are quite common in dry sandy soil around the island whilst the beautiful adults of Palpares libelluloides can be seen flying weakly over grassy areas. Many fascinating insects are probably blissfully overlooked by the majority of visitors, including representatives of two insect orders that are not native to northern and western Europe. 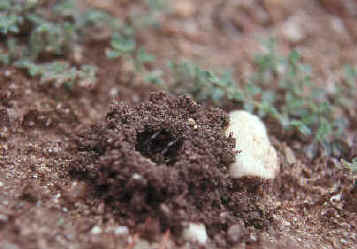 Both European species of termite (Isoptera) occur on Thásos, tunnelling in the soil under stones or in dead wood. Reticulitermes lucifugus is widespread in a variety of habitats but I have only once seen Kalotermes flavicollis. Also found under stones are the curious web-spinners (Embioptera), small insects that inhabit silken tubes along which they can move at speed either forwards or backwards. Haploembia solieri is probably the commonest species encountered on Thásos but I’m not aware of anyone having attempted the identification of these insects on the island. Stones provide shelter from the heat of the day and hence many species from a range of invertebrate Orders can be found by stone-turning (please replace them when you are finished). This can be a fascinating occupation but be aware that you may well discover scorpions (Scorpiones). 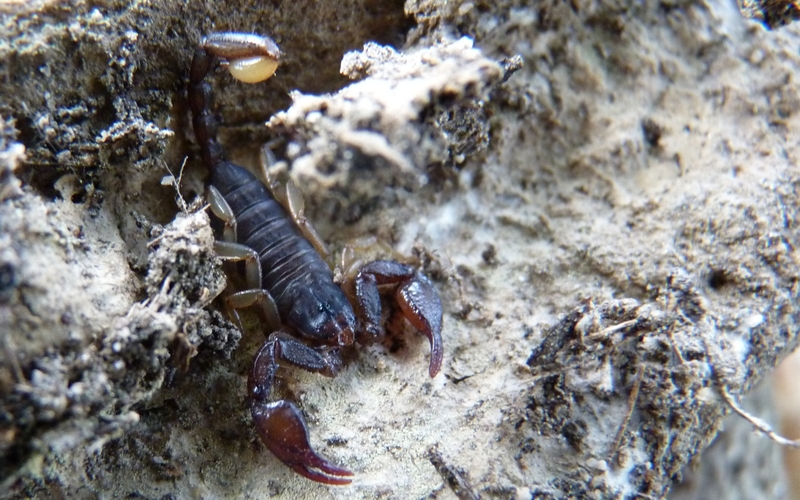 'Euscorpius sicanus', a small species up to about 3cm long, is widespread and not uncommon under logs and stones in old olive groves and woodland habitats. Fortunately it is harmless to Man, but be cautious as Mesobuthus gibbosus (with longer, narrower pincers) may also occur on the island and its sting is painful and potentially dangerous to infants. 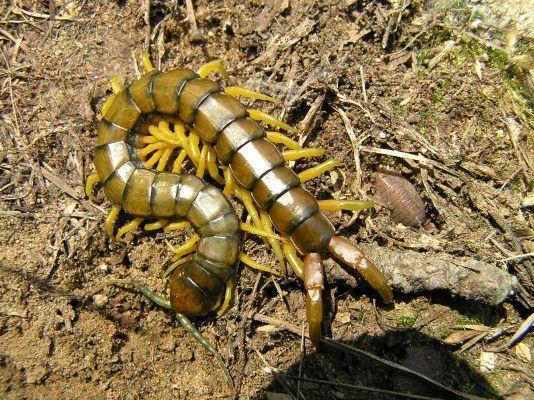 Also to be avoided are the grotesque olive green and red centipedes Scolopendra (Chilopoda). They can grow up to about 10 cms long and have a painful and potentially dangerous bite if handled. 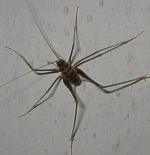 By contrast, the weird Scutigera coleoptrata occurs on walls where it can move very fast and may occasionally be seen in apartments. 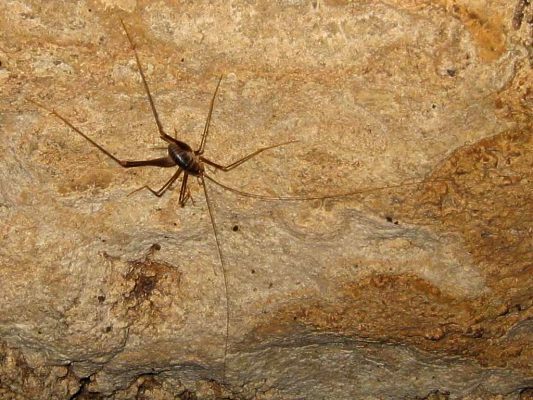 It can be distinguished by its 15 pairs of very long legs (not 100! ), but despite its alarming appearance it is harmless. True tarantulas, however, do apparently have a poisonous bite for which exertion and copious sweating seem to be both symptom and cure - one Greek remedy is for the victim to be "taken to the baker's shop where he is placed in the oven and baked over a bundle of faggots for as long as he can stand the heat" and similar 'cures' are reported from other parts of the Mediterranean. There is some uncertainty whether or not tarantula bites are poisonous but their retiring habits make it highly unlikely that any visitor to Thásos would be bitten anyway. True tarantulas (Aranea, Lycosidae) are wolf spiders and are not similar in appearance to the, so-called, 'tarantulas' of the tropics (or pet shops). On Thásos the species concerned appears to be Geolycosa vultuosa, although there may be other species involved. 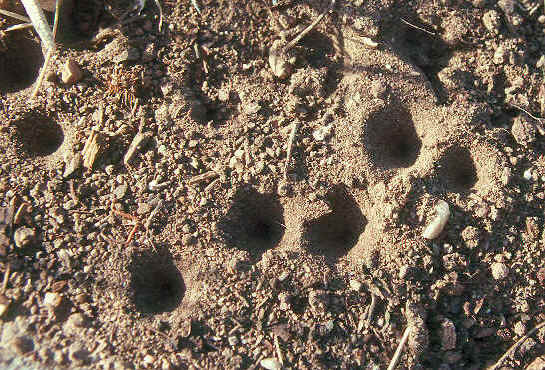 Their turreted burrows are not uncommon in bare friable soils alongside roads and tracks in the middle of the island but the beautifully marked spiders are rarely seen above ground. In my experience mosquitoes are rarely a problem on Thásos, but a lot depends on where you are staying, and whilst blackflies can be troublesome in the uplands (wear long trousers as they tend to bite at calf level!) most ‘bugs’ on the island are inoffensive. 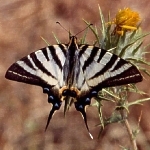 Certain groups, such as the butterflies and dragonflies, have been well-studied but much remains to be discovered and documented about the majority of the thousands of species that live here. They include endemics, such as the cave cricket Dolichopoda thasosensis (Orthoptera, Rhaphidophoridae), the ground beetle Tapinopterus insulicola, or the subterranean snail Balcanodiscus difficilis (Mollusca), and species new to science, such as the water beetle Hydraena elisabethae (Coleoptera, Hydraenidae), are still being discovered. I would be interested to hear from anyone with records of invertebrates from Thásos and I can provide information on many more groups than I have been able to produce web pages for to date. However, I cannot pretend to be able to help with the identification of most species - accurately naming invertebrates from this area of Europe is usually a long process involving the assistance of a wide range of specialists.